Michael Ness was promoted to Director, Corporate Security & Business Continuity for Sprint. Michael was previously the Asset Protection Manager for the retailer and has been a part of their team since 2005. He has also worked in security for the First National Bank of Omaha as a Security Manager, and at Tractor Supply Company as a Regional Manager, Auditing and Security. Michael earned his Bachelor's degree in Criminal Justice from Wayland Baptist University and went on to acquire his MBA in Business Administration & Management from Baker University. Congratulations Michael! Michael Suppe was named Territory Loss Prevention Director for Territory 1, West for Burlington Stores. Prior to joining Burlington Stores, Mike was most recently Director of Asset Protection, Western Operations, 7-Eleven Stores Inc. Before his time at 7-Eleven Mike held Asset Protection Management positons with West Marine, Kmart Stores, Michaels Stores and Wal-Mart. Michael began his career as a Deputy Sheriff, County of Los Angeles, Los Angeles CA. Mike holds a Bachelor of Arts degree from Sonoma State University. Congratulations Michael! Justin was previously the National Manager of Asset & Profit Protection Learning & Development for Sears Holdings Management Corporation and had been on their team since 2014. He has also held other loss prevention roles such as Corporate Director of Loss Prevention, District LP Manager and Multi-Store LP Manager for Sears, Roebuck and Co. and Region Loss Prevention Manager for PETCO Animal Supplies, Inc. Justin earned his Bachelors degree in Criminal Justice/Safety Studies from Metropolitan State College of Denver. Congratulations Justin! 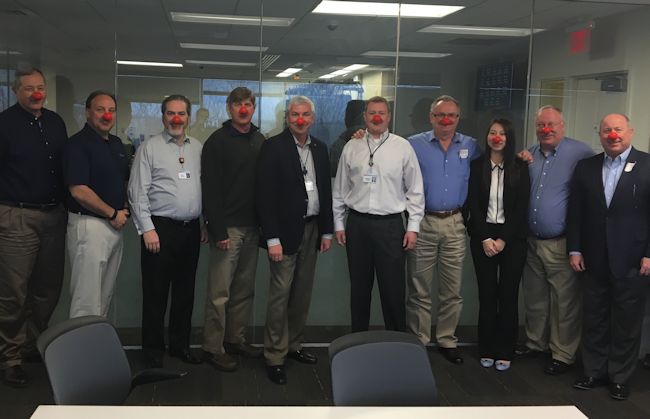 Walgreens' on Wednesday challenged fellow Chicago native Wrigley Co. and Atlanta's very own Coca Cola Co. to a "Red Nose Rumble." The two iconic brands were called to the comedy carpet to get "seriously silly" April 6 on their respective social media outlets in support of eliminating children's poverty. LP teams, send in your selfie and win! 3 Pizza Parties and one person gets to go to NRF Protect 2017! Show your LP Team Pride! Submit your new 2016 Group LP Selfie here! Thomas M. Coughlin, a former vice chairman of Wal-Mart Stores Inc. and close friend of the retailer's founder, died Friday, according to the company. He was 66. The 6-foot-4 Mr. Coughlin was a Wal-Mart legend -- a protégé and old hunting buddy of founder Sam Walton and for five years was the second-highest ranking executive. He started at the company in 1978 as director of loss prevention, and later was an integral part of the executive team that made Wal-Mart the largest retailer in the world. But he is perhaps best known for the scandal that erupted around him as he retired as executive vice chairman in 2005. He left the company amid accusations he misappropriated as much as $500,000 from Wal-Mart through fraudulent reimbursements and improper uses of gift cards. After pleading guilty to wire fraud and tax-evasion charges, he was sentenced to 27 months of home confinement in 2006. The judge spared him jail time in part because his doctor at the time described him as "57 going on 87," saying he had coronary disease, diabetes and other ailments. He started his career with Macy's, in San Francisco, and was working in security for Cook United Inc., the now-defunct Cleveland-based chain that included the Cook's and Uncle Bill's stores, when Walton recruited him for Walmart in 1978. Gus Downing senior, the vice president of security for Cook United in the 70's, actually hired Tom Coughlin at Cook United. Mexican traffickers have inundated the St. Louis area with a new, potent form of heroin, drastically reducing prices for the drug and increasing its strength to attract suburban users. The dispersal of the cheap heroin has led to a surge in overdoses, addiction and violence in cities across the country. Besides St. Louis - where the problem is particularly acute - Chicago, Baltimore, Milwaukee and Philadelphia have attributed recent spikes in homicides in part to an increase in the trafficking of low-cost heroin by Mexican cartels working with local gangs. "The gangs have to have a lot of customers because the heroin is so cheap," said Gary Tuggle, the Drug Enforcement Administration's chief in Philadelphia, who observed the same phenomenon while overseeing the agency's Baltimore office. "What we are seeing is these crews becoming more violent as they look to expand their turf." A report from the Association of Certified Fraud Examiners found that while the average organization loses about 5% of revenue to fraud every year, the losses are less severe at those that employ anti-fraud controls. At organizations that use proactive data monitoring and analysis, fraud schemes resulted in a median loss of $92,000, compared with $200,000 at organizations that didn't monitor and analyze data. Requires gas-station owners to use additional security measures on self-service pumps. The Department of Agriculture and Consumer Services may also prohibit the use of fuel pumps until such security measures are installed. More than 190 skimmers have been found statewide since the beginning of 2015. Approximately 100 consumers are victimized by each skimmer, resulting in $1,000 stolen from each victim on average." "Each skimmer represents an estimated $100,000 threat to consumers." It's tourists becoming tightfisted. International visitors continue to flock to New York, but they are not spending nearly as much as they used to, especially on shopping. ● It's weakness in holiday hiring. We know retailers slashed their normal seasonal hiring last fall. Dollar Express is the newest entrant in retail's dollar store segment, headquartered in Charlotte, North Carolina. Our stores are currently bannered as Family Dollar stores and will be converted to become Dollar Express stores. We're a start-up in the sense in that the corporate support function and all of the associated infrastructure needs to be developed, but we begin our journey with 330 store locations coast-to-coast in 36 states. Dollar Express is backed by Sycamore Partners, a leading private equity firm that specializes in retail and consumer investments. The US and Canadian Governments have issued a joint alert about ransomware infections in the wake of more hospital infections. Now, with the adoption of EMV technology in full swing, two questions remain top of mind for payment sector executives, retailers and customers alike - will the transition to chip and PIN make credit cards and transactions more secure from attacks? What impact will this change have on other payment methods? Experian believes that it is not a silver bullet against attacks and predicts that the payment industry will continue to face breaches despite the migration. Only half of executives in the payment sector believe chip and PIN will decrease the risk of a breach. In fact, 64 percent believe that it is more challenging to secure payment card information than any other identifiable information. Dave Matthews, executive vice president and general counsel of the National Restaurant Association, which represents more than 500,000 restaurants throughout the country, says the group questions whether EMV is really ready for "prime time." And Matthews alleges that the significant increase in chargebacks is unfair, given the current state of EMV and the questions about whether all the transactions cited for chargebacks are actually fraudulent. A company's security infrastructure is more vulnerable during the Mergers and Acquisition (M&A) process, according to new research from Digital Shadows. 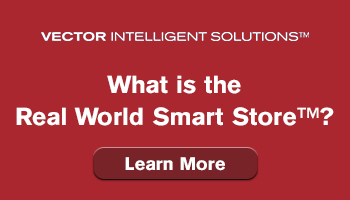 StopLift’s Scan-It-All video recognition technology has confirmed more than 1.5 million-plus incidents, which include “sweethearting”, when cashiers pretend to scan merchandise but deliberately bypass the scanner, thus not charging the customer for the merchandise. The customer is often a friend, family member or fellow employee working in tandem with the cashier. 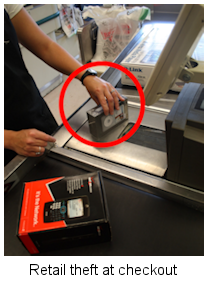 Many scan avoidance incidents are also caused by customers using self-checkout. See real scan avoidance incidents - and a realtime incident counter at www.StopLift.com. 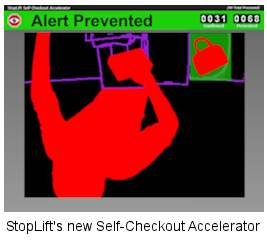 Retail chains can now receive realtime reporting on self-checkout theft and other scan avoidance, prevent false alerts and interventions, alert the attendant before the customer leaves the store, and improve customer service at the self-checkout with StopLift’s new Self-Checkout Accelerator. The U.S. National Retail Federation states that retail shrink was $44 billion in 2014 and about $14 billion of that is due to scan-avoidance. Supermarkets, with their lower profit margins, are particularly vulnerable to scan-avoidance, which has accounted for an almost 35% profit loss industrywide. Gus Downing, Publisher and Editor of the D&D Daily and LPNN, introduces the LP Leaders portion of our "Live in NYC 2016 at the NRF Big Show" broadcast. Learn about the vision and mission behind retail LP’s only digital fast-break conference. With interview topics including Omni LP, High-End Retail LP, Analytics, Organized Retail Crime, EMV, Cyber Security, Critical Incident Management, and a host of other subjects - these videos offer valuable insight and information from the leaders of the LP industry directly to you - live and on-demand. Stay tuned! Co-MC Amber Bradley gives a shoutout to all the sponsors who helped make our broadcast possible. She also previews what’s to come. With surprise guests lined up throughout the afternoon, who knows who you might see, or what you might hear! When you’re LIVE, anything can happen. Fraudsters, it appears, are more organized and better prepared than the card networks. They've been aware of the coming change for some time and they positioned themselves to get ahead of it. A recent Forrester report titled "Stop Billions in Fraud Losses with Machine Learning" indicated North American fraud losses would increase 55 percent by 2018. And it has already begun. Forrester indicated that fraud attacks increased by a substantial 163 percent just during the first three quarters of 2015. Moreover, fraudsters don't give up and they don't want to risk their illicit income being stopped by a new kind of card - so the move online, even ahead of the EMV curve, is a logical one. Fraud is crucial to fraudsters' bottom lines, and they're individual, autonomous agents who don't have to worry about process and compliance the way retailers or card networks do. They're also highly creative, they share information and techniques and they're part of a sophisticated underground ecosystem. They know there's money to be made out of CNP transactions. Online, mobile and phone orders are a highly tempting and potentially very lucrative target. A fraudster's success is an online merchant's loss. The retailer takes the hit for a fraudulent transaction and all the associated costs - and with CNP fraud attacks on the rise, that means retailers without fraud prevention capable of meeting the challenges of modern e-commerce are facing huge potential loss. A recent report by Arxan - a company that specializes in software security and mobile application protection - has found that out of all the mobile apps tested 90% of the applications unveiled multiple vulnerabilities. The LPRC's Organized Retail Crime and Product Protection Working Groups are collaborating together this year on a common research initiative: ORC High-Theft Items, otherwise known as "Hot Products List." The LPRC would love to have several different retailers weigh in and help provide insights into this very important topic in the industry. What are your organizations' top high-theft items? The names and associations collected on this survey will be kept confidential; we also give you the option to include your organization's name. The purpose of this survey is to provide retailers with knowledge of multi-industry common ORC/hot-product high-theft trends and to better prepare retailers for potential high-theft threats in any given year. The information you provide will be purely for research purposes. The information will be able to be accessed through the LPRC to interested members. The LPRC's goal is to have a list of these high-theft items representative across different industries. 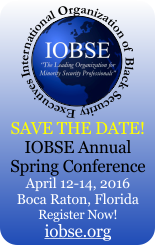 For more information, please contact Brittany at brittany@lpresearch.org. Do you have an ORC case to share? 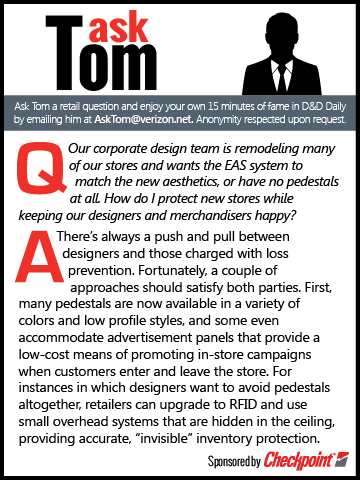 This is a retained search for the D&D Daily. William Connors was named District Loss Prevention Manager for Giant Eagle. Bianca C was named Market Asset Protection Manager for Walmart. Sheila Martinez was named Regional Loss Prevention Manager, Region 2, San Francisco, CA for Burlington Stores. 11 Things Really Great Leaders Say Every Day to Employees Leaders are extremely busy, and it can be easy to forget to regularly take the time to inspire and lift up your employees. Not only do they appreciate it, but it also improves productivity. Here are some things they really want to hear. Great job! Everyday you've got to work and you've got to ask yourself what value are you adding to the company, to the industry and to your career. While this may seem rather ominous at first, try reducing it to your daily tasks and just make sure that with every effort you make there is value you deliver to someone, to some store or to some project. If you can merely focus on the word "value" and ask yourself am I delivering it everyday, you're then one step closer to advancing your career. Because if you can build the field they will come and play. feature here? Let us know. Post on our Featured Jobs Board! Reach your target audience in 2016 every day!